Wister is a neighborhood in Northwest Philadelphia, Pennsylvania, United States. It is bounded by Chelten Avenue to the north, Germantown Avenue to the west, Belfield Avenue to the east, and Wister Street to the south. Wister is a section within Germantown. The Clarkson-Watson House, Fisher's Lane, Grumblethorpe, Grumblethorpe Tenant House, and Ivy Lodge are listed on the National Register of Historic Places. 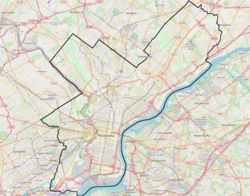 ^ "Philadelphia Neighborhoods and Place Names, Q-Z". Philadelphia Information Locator System (PhILS). ^ "Wister Neighborhood Council, Inc". Wister Neighborhood Council. This page was last edited on 22 September 2018, at 00:39 (UTC).